Linda Fazio sees people as tapestries woven of strands that correspond to health, culture, creativity and the search for meaning. That’s not surprising, because Fazio, assistant chair in the Department of Occupational Therapy, began her career as a weaver of wool. Now she studies how people weave their lives into whole, complicated cloth, using their own “warps” and “shuttles” to create meaningful lives. Fazio’s field, occupational science, is unique among the basic sciences in that it studies how human beings adapt to challenges by using “occupation”-self-initiated, organized, goal-directed units of activity, such as golf, work and dining. Taking an interdisciplinary perspective, occupational science systematically analyzes how occupation supports health and meaning to lives. As the theoretical grounding beneath occupational therapy practice, occupational science provides a base that explains how people weave new life patterns as needed. The large number of federal grants in the department attests to the significance of occupational science in understanding rehabilitation and wellness. Both Fazio’s work and occupational therapy itself originated in the arts and crafts movement. In the early 1960s, occupational therapy practice in psychiatry was grounded more in the fine arts than in a medical model. Therapists worked with psychiatrists to use art for rehabilitation. While practicing occupational therapy, her call led her to study painting on fibers, particularly in an East Indian style called “ikat,” which created a Monet-like painting. Galleries in Boston and New York showed her work. Soon she became a fiber arts instructor and sought-after weaver. 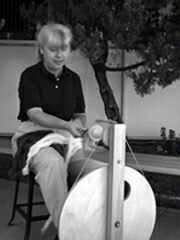 She learned spinning and shearing, and earned a master’s degree in anthropology and museology, comparing Hopi and Navajo fiber technologies and implications for transcultural migration. The next threads on her personal loom added striking new texture: a faculty appointment in occupational therapy at Texas Woman’s Univ. and a Ph.D. in Higher Medical Education and Administration at the Univ. of North Texas, all the while creating weavings on commission. She became Assistant Dean in the School of Occupational Therapy at Texas Woman’s Univ. in 1984 and three years later, was invited to USC-for a faculty position in occupational therapy, one of the first university programs to focus on the study of occupational science as a discipline. A fundamental concern of occupational science is how occupations have meaning, which in turn inspires people to take control of their lives. Occupational therapy can arouse an individual’s power of engagement in occupation-a transcendental motivation-to recover from illness or adapt to a disability. One of Fazio’s current projects, a collaboration with the Los Angeles Parks and Recreation Programs, enables 100 disabled children in the local community to experience the inspiring and transforming concepts of occupation. This summer, Occupational Therapy students taught arts and crafts to children, and helping them to acquire a sense of joyful mastery over their own challenging environments. Why do we do what we do? and, What meaning do we bring to our lives? are questions Fazio regularly ponders. Occupational science, she says, pursues answers with a variety of approaches, including the arts.